Evening strains to be time's vast, | womb-of-all, home-of-all, hearse-of-all night. With: Our evening is over us; our night | whelms, whelms, and will end us. Where, selfwrung, selfstrung, sheathe-and shelterless, | thoughts against thoughts in groans grind. I was inspired since Myriam Moscona (translated by Jen Hofer) quotes this poem ‘spelt from sibyl’s leaves” in an epigraph . I thought it would be interesting to read this apocalyptic vision before presenting these three poets, all of whom seem to me in a notable way to in an oracular way to be writing a poetry of the future –at least exploring a future I hope for even if in some ways it is a dream and in other ways it is already here: hybrid, polylingual. This future poetry is a poetry of translation and, equally powerfully, leaving things untranslated (untranslation? ), a poetry of zones -- “documentary zones” and “contact zones” are some zones that Jill offers in SLOT for instance , and a poetry that is not limited to language: a poetry of image, a poetry of living the world, a skeptical and wounded poetry, a poetry of love.. Something hovering between memorial and dismemberment. 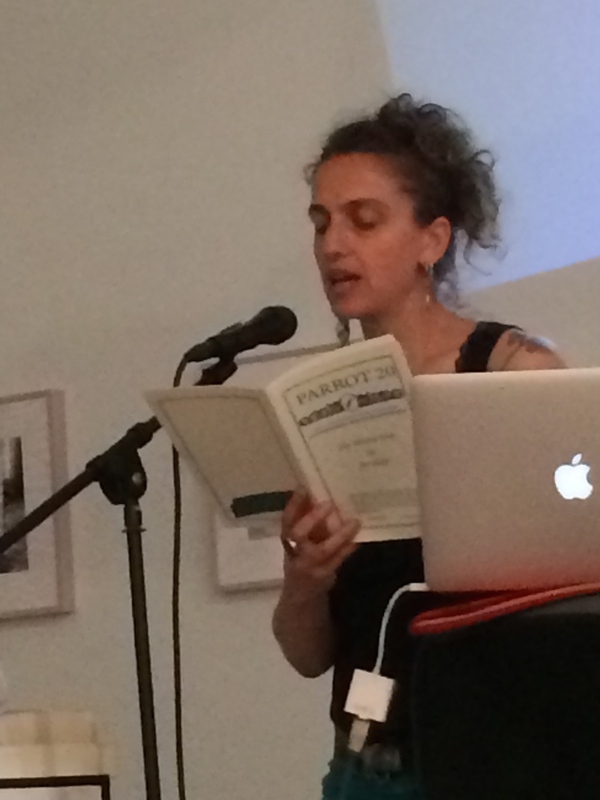 Jill Magi’s poetry operates as a kind of language architecture. Her words are things, bodies, envelopes She reminds us that the tiniest element of a place can change you. "More than a structure, what do you feel? More than a sentence." "If alone, I am even more softened, emptied out, a little lonely, and this feeling makes my desire to learn more intense." One of my favorite gestures in SLOT are the occasional page devoted to reading list – like a bibliographic appendix scattered into the middle of the text, a gesture of laying her cards on the table, a personal scholarship, quasi-autobiography through sources. I love the juxtaposition of “REGARDING THE PAIN OF OTHERS” and LONELY PLANET USA” – this could be reading list, bookshelf transcription, a bitter quip, . is this a note of tragic solipsism, or is it hopeful? I see the materials of her collages – the Cartesian graph the handsewn stitch, as a gesture of recuperation. Hofer writes of “a little female library” and I think there’s something in this idea of a gendered archive celebrating its littleness, its stance against from a maximalist collection that would contain everything. She uses newsprint- and news is of course an originator of the whole idea of ideas as content filling the rectangular space between the ads… She writes about drones and I see the same kind of recoiling from the inhuman. 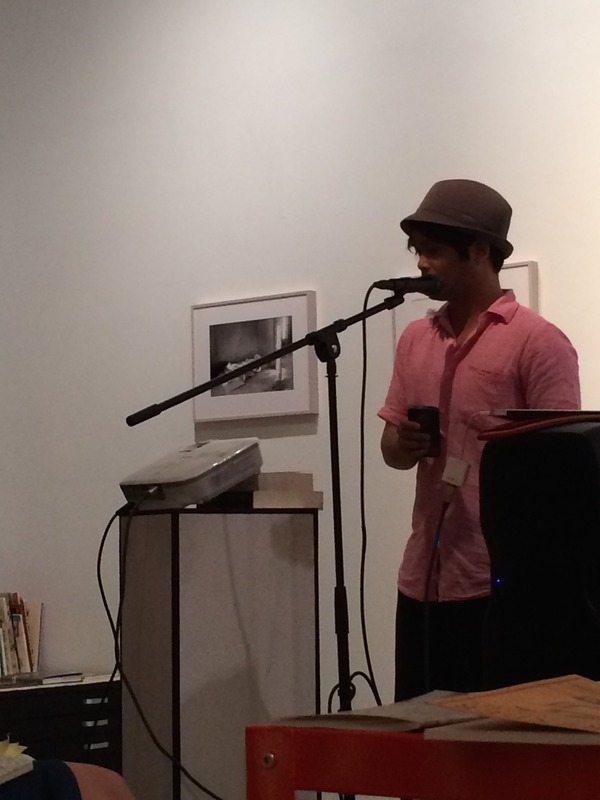 “What is it to be a person’ her poem poses explicitly against drone surveillance and violence. The future is positive but not progressive in a ‘ brutally inhuman’ way that merges differences. Paolo Javier’s poetry is also rooted in questions of language that are questions of self-definition. His poems are windows into polylingual consciousness. a projectile question desires a career. Apaloosa, Apaloosa B. Infinity’s escape. dense, political, engaged poems that are love poems rooted in difference. Identity is always at stake. Channeling the otherness of English. I was reading about the distinction between englog (English grammar) and taglish (english words in tagalog) and I think it’s partly these sorts of linguistic questions that animate what Paolo does. intense linguistic energy. At times as if he’s trying to bring across the active-passive qualities of tagalog into English. the ultimate “other” is the beloved, with whom we are endlessly fascinated, and with whom we want to merge, to know and be known by.